Christenings (sometimes called Baptisms), is the sacrament of initiation into membership of the Church, the Body of Christ. The birth of a child is a cause for celebration. Many people are overcome by a sense of awe at the creation of new life and want to express their thanks to God. If you are considering baptism it is important that you know something about the church for which you will be baptising your child into. Therefore initial baptism forms are only given out after you have attended a 10:30am Sunday morning service. Generally, the Church of England encourages baptisms of children in their own local parish. The reason for this is to build up connections with a church which is local to you so can possibly walk to it and get to know your neighbours who may go as well. However in certain cases St Barnabas Church will baptise children and adults who do not live in the parish. 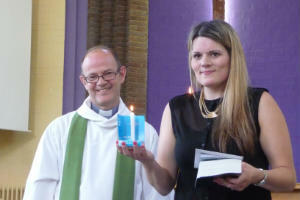 If you like to know more about baptisms please contract Richard our vicar.